One of my favorite episodes of the Andy Griffith show is the one where Barney buys his first automobile and the ensuing comedy that comes along with it. For $300.00 (that’s right, three hundred dollars), Barney gets himself a beautiful black “1954 Ford See Dan” as he describes it while reading the advertisement to Andy in the Sheriff’s Office. According to him, it’s the biggest purchase he’s ever made other than a septic tank he bought for his parents once. Andy tries to counsel him to be cautious about the purchase but Barney is immediately taken in by the kindly old widow, Mrs. Lesch (wonderfully portrayed by Ellen Corby, aka “Grandma Walton”) whose late husband coincidentally shared his proper name with Barney and who treasured the car. Barney buys the vehicle of course and one of the funniest scenes in television follows with the car breaking down several times amid the sounds of grinding gears and failing parts. Barney has just purchased a $300.00 lemon. It wasn’t so much the part of the show where Barney finds out his car is a lemon that I relate to as much as the visible joy on his face when the car first comes in sight. There is nothing in the world that adequately describes the feeling of that first time seeing what will be your very first car and 31 years after that experience for me, I can still remember how it felt when that happened to me. Just a few weeks before my 16th birthday, Dad came home unexpectedly in the middle of the day. I was sitting in the den watching something on television with my brother when he walked in and said he had something to show us. We jumped up immediately because anytime Dad said he had something to show us, we knew it was going to be something worth getting up to see. He was always bringing something home-a car, a pickup truck, a cat from the family restaurant…one time a bus. Yes, he bought a bus once that he got a deal on so he could flip it and make a few extra dollars. Dad enjoyed buying and selling cars more than anyone I ever knew, much to my mother’s dismay I’m afraid. We were banking on a helicopter this time. As it turned out, a helicopter was not to be in the cards for us but I didn’t really care at the moment. I didn’t now how to fly one anyway but I sure knew how to drive a car and when Dad handed me the keys to the 1975 Ford Elite that sat shining in the driveway and told me it was mine, I had an epiphanic moment that I had never experienced before and to date, have never experienced again. Like Barney, I was suddenly Mr. Independent Wheels. Except I wasn’t…not quite yet. I still had two weeks to go before my 16th birthday; until then, I was at the mercy of my parents good graces. Dad did let me drive him around in the car for a little while that day but with his work schedule and my mother’s fear of my driving, the time my car and I got to spend together was mostly in the driveway. I spent the time getting to know my new ride intimately. My Elite was seven years old when Dad bought it for me and while many of my past “rides” have faded from memory, I can still remember the details of this car quite well. First off was the color…Ginger Glow Metallic. This was a fancy way of saying “Brown”. Brown with a saddle colored vinyl padded top. 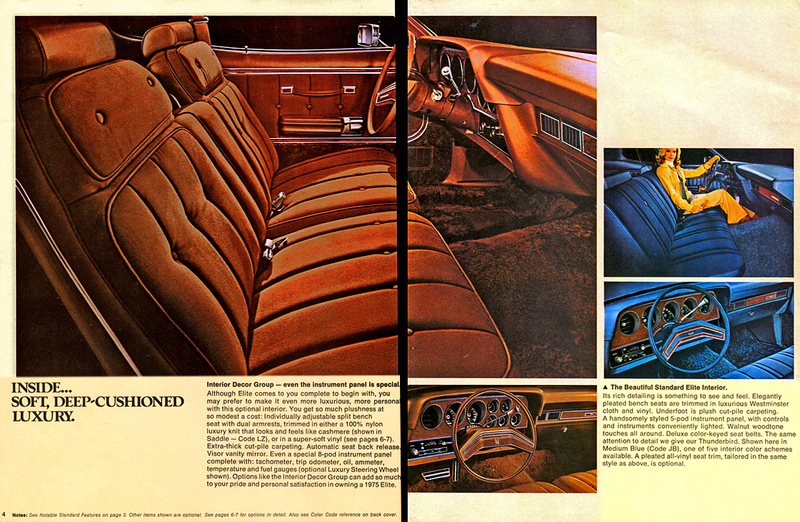 This was a 1975 model and padded vinyl tops were the height of automotive fashion at that time. It had a big grille and large round headlights with a stand-up hood ornament on the end (another fashion statement that would carry on into the 1990’s). It was a good thing that it had a hood ornament too because the hood was as long as the landing deck of an aircraft carrier and without it, it was hard to judge from the driver’s seat just where the front end of this behemoth began. It was also a coupe (coo pay as Barney would pronounce it) aka as a two-door car and what doors they were…when fully opened and extended the car had a wider wingspan than a Boeing 747-they were long and weighed a ton. Getting in and out was a breeze but God help you if you ever parked in a narrow space between two other vehicles and mine did not have the optional sunroof which could have been used as a backup escape route in such occurrences. As a matter of fact, my car had very options at all. The few that it did have consisted of an AM-FM radio, a passenger side rearview mirror and air conditioning. The driver side mirror, automatic transmission, power steering and power brakes were all standard. It also had a set of white wall tires fitted with wire wheel hub caps that the previous owner had taken from a Ford LTD. Chrome trim was everywhere…over the wheel wells, around the grille, the roof moldings and of course, the front and rear bumper. The inside was upholstered in medium brown “Westminster” cloth which covered a full-length bench seat. This was the kind of seat where if the driver pulled the lever to move the seat, everyone in the front seat went with them. The back seat had a clear vinyl seat cover installed over the original upholstery to keep it new. My brother still loves to poke fun at the slippery vinyl cover over that seat. The doors and dashboard were covered in thick padded vinyl and a forest of plastic wood grain trim gave it a touch of overwrought elegance and class. 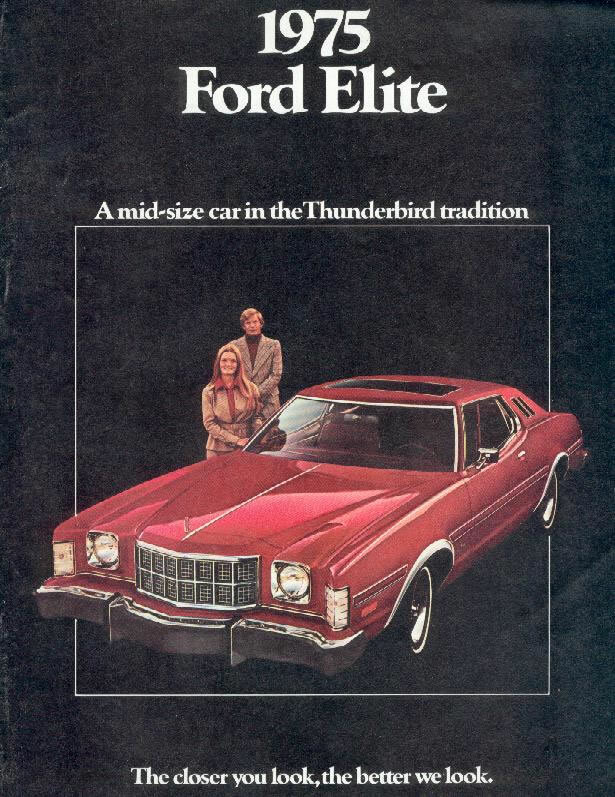 Billed as a “Mid-sized car in the Thunderbird tradition”, the Elite was the epitome of a 1970’s automobile with pretensions of grandeur, from its vinyl roof with dual “opera windows” to its faux wire wheel hub caps. 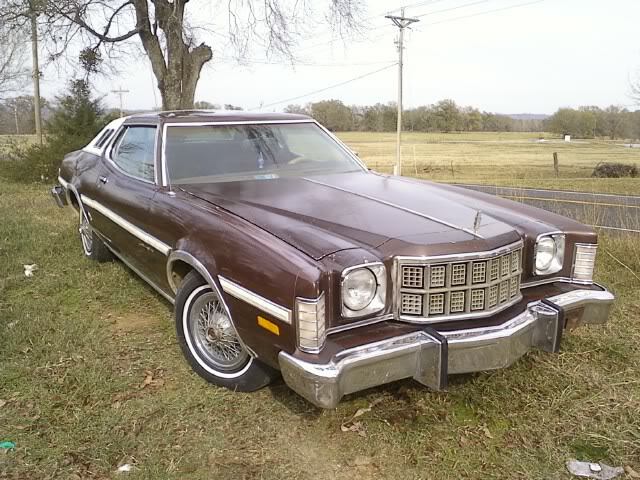 Sold for three model years as a lower priced alternative to the then-venerated Ford Thunderbird, the Elite was the car for young people on the move in 1975. In 1982 however, its time was already past and it’s kind was well on the way out in favor of more fuel-efficient cars. For me though, it was my first car and each time I saw it, I would swell with pride at its shiny metallic brown paint and long sloping hood. Mid sized it might have been in its day but compared to what passes for a midsize car in 2013, the Elite was a land yacht that was a lot to handle when my birthday finally came and my license was in hand. For starters, the car was a whopping 18 feet long and 6.5 feet wide. That’s almost two and a half feet longer than my 2012 midsize car and nearly half a foot wider. 16 feet of that was the hood. Okay, not really but it seemed like it. Cruising behind the big, hard plastic steering wheel, I felt like the Captain of my own ship because it handled only slightly better than the Queen Mary and because parking it was something akin to docking a boat. Backing up was worse because the narrow window and huge pillars made rear visibility virtually nonexistent and during the two years I had it, I managed to back over one bicycle, a couple of metal trash cans and a friend’s brand new Chevy Camaro. The car was not without its virtues though. For one thing, it would run like a politician. One of the reasons the car had such a long front end was because underneath that hood was a monster sized engine consisting of 351 cubic inches of Detroit motor with eight pulsing cylinders and four wide-open carburetor barrels, all humming with raw Ford power. It took a lot to get a car that size moving but the Elite had what it took and I often found myself at wide open throttle heading down the open roads and highways in the county in which I still live. It took all of two days for every police officer in the county to know my car and who was driving it…in fact I was pulled over just a couple of days after I got my driver’s license because one of the neighbors called the police and told them I was driving without a license. With the car came freedom to go where I wanted when I wanted to, held back by only two things: gasoline and repairs. First off, the car held just over 26 gallons of gasoline and when I turned 16, gas was at an all time high of $1.50 something a gallon. That sounds wonderful today but in 1982, that was a lot of money for a gallon of gasoline. Considering that I didn’t have a job other than some work in the family restaurant for $3.00 an hour, my earnings were pretty low and then there was the gas mileage of the car itself to consider…with my driving habits, I was lucky to get 12 miles to the gallon so my independence on the weekends consisted mostly of cruising around town and parking on the square. Every $5 and $10 bill I managed to get usually went right into the tank. The car spent most of its life with the fuel needle perched somewhere between empty and a quarter of a tank. Birthdays and Christmas was about the only time I had enough money to see the needle anywhere near the “F” on the fuel gauge. Then there was the upkeep of the car. Whoever owned the Elite before Dad got it had taken very good care of it so that it looked brand new when he got it. I’m sure the person that drove it was probably some little old lady who never went over 40 miles an hour and babied the car so it wasn’t quite prepared for the undeserved treatment it suddenly found itself subjected to in its twilight years. Tire burnouts, high-speed runs and traveling around town with sometimes as many as eight people took a harsh toll on its motor, tires, shocks, springs and general appearance. The Ford Elite kept Maurice Biles in business. In two years, it went through three sets of white wall tires, several alternators and batteries, a shock absorber, muffler, belts, hoses and a variety of other items. Most of these were paid for by Dad who once tried to cut his losses by buying me an AMC Pacer to replace it. I wouldn’t have any part of the Pacer and stuck to the Elite, despite its troublesome record of reliability. It overheated. It sometimes wouldn’t crank. The brakes went out on it one time and it managed to lose a few wire hub caps, resulting in mismatched Ford wheel covers on one side. It was a bear to change a flat tire on and it backfired now and then. Despite everything, it never had a problem drinking gasoline or oil for that matter. I learned early to keep a box of Quaker State in the trunk for emergencies. One thing that never failed until the end was the air conditioning. Ford automobiles of the 1970’s had some of the best air conditioners around and mine could have been used for a backup if our refrigerator had ever died. I once turned it on full blast for an hour and used a thermometer to see how cold we could get the interior. In the heat of summer, the Elite got down to a near-frosty 51 degrees after an hour at full speed. Other things were not so reliable. One day I cranked it up and the motor caught on fire. Seriously, there were flames coming from under the hood. Fortunately, Emory Spencer, a neighbor who sometimes helped me fix the car came running and with him, Terry King, a firefighter who happened to be visiting. They got the fire out before any serious damage occurred and after a new paint job on the hood and a new carburetor, the Elite was on the road again. I won’t go into a lot of detail about the time I evaded Barney Wilder, a local police officer who had once been the Sheriff of the county or the time I ran over a friend’s dog and got a tongue lashing that I have never forgotten (the dog did run out in front of me and I couldn’t avoid it). Suffice to say considering the way I drove, the number of friends who rode with me and the Elite itself, I am very fortunate that God watched after this particular teenage driver. Two years afterwards, on my eighteenth birthday, my Dad brought home another car for me, a Honda Civic hatchback that got double the mileage of the Elite and was about half as big. By then, the Elite looked every bit of its nine years of age, covered with dents, dings, chipped paint, cracked windshield, seats with busted springs and, in the end, a non-working air conditioner, a necessity in Georgia. A friend of my Dad bought the Elite for a few hundred dollars and shortly thereafter wrecked it beyond repair. The Civic was practical, reliable and fuel-efficient and it served me well for the next several years but it was never the car, the automobile that my 1975 Ford Elite had been. The Elite had presence, the Elite had power and despite all of its shortcomings, it was darn fun to drive. Every now and then, rarely, I will spot one going down the road, usually a perfectly restored example proudly owned by some car collector and for just a moment, I’ll feel that same sense of joy and excitement that my own Elite elicited from me over three decades ago. I wish I had been more appreciative of it back then and maybe had kept it going as I would love to have it today. I’d need a larger, 1970’s sized garage though and I imagine if I ever find one and bring it home with me, my wife will make me sleep in it. Rest in peace, faithful friend. Those Elites were ginormous on the outside, but surprisingly cramped inside. I’ll bet your current midsize car has more interior room! I think all that vinyl padding on the doors took up a lot of the interior Jim…thanks for the read! 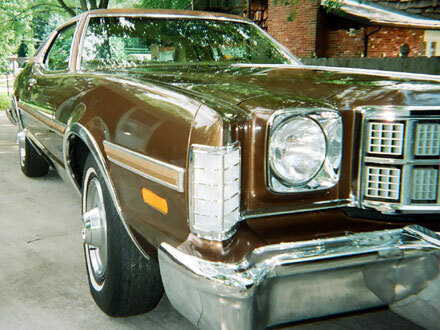 We have a 1974-1/2 model of the Elite … in Ginger Glo Metallic … with white vinyl interior. It too caught fire … I’m wondering if there was a defect that Ford never addressed with a recall? Very touchy steering … but a damn nice car. Ours has only 40,000+ miles and has never been in an accident. In fact I think everything except the carburetor and control module is original … probably on the second set of tires. I recall very well the day I went to purchase it on behalf of my Grandfather … I felt very special. They were a boat to drive but I always felt pretty special with what seemed like 14 feet of hood in front of me and the hood ornament standing tall at the end. Sounds like yours has become a family heirloom, much like my grandfather’s pickup truck has. Enjoy the Elite, it is the last of a breed!